Someday in the future we may very well find more efficient ways to transport goods than large diesel-powered trucks, but for now making those big trucks more fuel efficient would go a long way toward lessening their environmental impact. This simple product from ATDynamics takes a concept already used to make airplanes more aerodynamic and applies it to the massive numbers of trucks on the road. The little bits on the tips of airplane wings that point up are called “winglets.” Their purpose is to reduce drag and help planes fly more efficiently. By putting similar winglets onto the backs of semi trucks’ cargo areas, a similar effect is gained. The flap-shaped attachments can reduce fuel consumption by up to 6.6 percent, a number which may sound small, but spread out over the some two million tractor trailers in the U.S. could have a huge impact. Just one truck using the device can save as much fuel as the typical car uses in an entire year. ATDynamics calls their product TrailerTail. 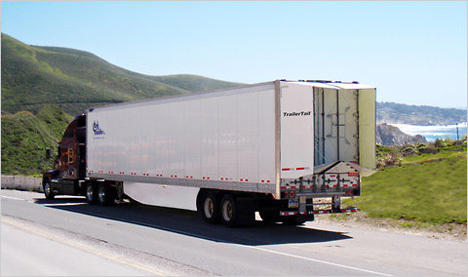 It attaches to the rear of the trailer and, when the truck is moving, sticks out about four feet at an angle that reduces wind drag. 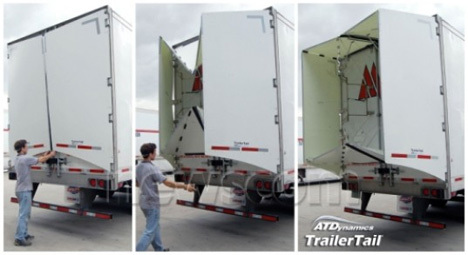 Made of little more than plastic sheets and metal springs, the TrailerTail can fold flat against the back of the trailer or lie flat against the side of the truck when the doors are open. 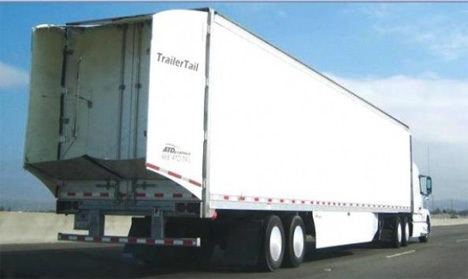 Far from being an out-there idea for future generations to refine, the TrailerTail could become a necessity very soon thanks to the EPA tightening standards on truck fuel efficiency. See more in Cars & Trucks or under Transportation. August, 2011.